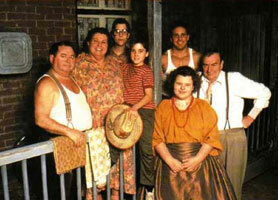 In 1983, Ginette appeared twice in the "Du Tac au Tac" sitcom. The first time, she was playing a cleaning lady. It is Ginette who came up with the idea of playing her role as a singing cleaning lady. The second time, she was playing herself. In 1988, Ginette appeared in "L'amour avec un grand A" of Jeannette Bertrand. Ginette says she learned a lot from Mrs Bertrand and that this role was a real gift for her. In 1991, Ginette answers the call from Jean-Claude Lauzon and plays a tough role in Leolo. "The scene I remember most was when I had to hold my son on the floor, that was heartbreaking". In 1994, it's now Christian Duguay who asks Ginette to be part of "Million Dollar Babies/Les jumelles Dionne". Ginette loved the filming and all the crew, she remembers very vividly a scene where she had to run through thin walls. Many scenes were gruelling as they demanded physical as well as intellectual involvement. 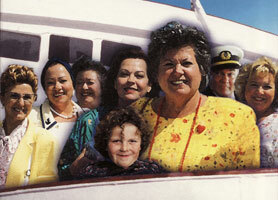 In 1997, Ginette plays Louise Dawson in the "Une voix en or" mini-series. This series was a hit in France, a bit less in Quebec. Ginette really enjoyed the filming, done in a wonderful environment and with a really good crew. She has fond memories of a few dinners, taken with the whole cast, at Fouquets, on Les Champs Ã‰lysÃ©s. In 1998, all QuÃ©bec falls in love for "C't'Ã ton tour Laura Cadieux", this movie was a huge hit. Ginette especially enjoyed the complicity she developped with Pierrette Robitaille and Denise Filiatrault. When Denise Filiatreault arrived with the second "C't'Ã ton tour Laura Cadieux 2" in 1990 , I was eager to read the script. I was delighted to the thought of living a love scene. I want to thank Michel Tremblay, Denise Filiatreault, Denise Robert and Daniel Louis. I also thank all the actors and actresses with whom I enjoy to play and with whom I develop solid link since. The other day, I found myself watching the movie on television, with the same enthusiasm as in the beginning. Long life to LAURA CADIEUX. 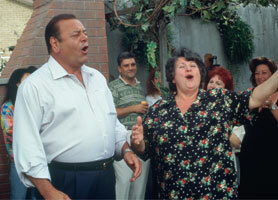 What a privilege to play with Paul Sorvino and be is wife in Mambo Italiano in 2003. I had to study to pick the Italian accent. At the beginning, I had a Jewish accent rather than an Italian one. I laught my head off during the whole shooting. I thank Denis Robert for choosing me to play Maria. I still remember when I pass the audition and Ã‰mile Gaudreault, the director, ask me to remake a scene in ten different ways. I faked to be offended. Me how believed I was a one woman take, "I toll him". I was sure that no one would call me back, but once arrived at home, a message was waiting for me. Thanks to all the formidable actors. Thanks to all the Italians for the earth. I would like to thank my director Ghyslaine CÃ´tÃ© how brought me on a silver platter the part in the movie "Le secret de ma mÃ¨re", and also Martin Girard, the scriptwriter, for the beautiful and good script. As I am the kind how like to learn and understand, it was a pleasure and an immense joy for me to play Blanche in this romantic comedy. I play a woman between the age of 46 and 73. At 73 years old, I had a little shake. I think with my husband Jos I saw all imaginable colors in spite of the passion I had for him at the beginning of ours relationship. Once the passions vanished they made room for resentments on my part. Like in all the families of the world, there's a secret to uncover during the movie. I invite you to see "Le secret de ma mÃ¨re" and send to me yours comment.